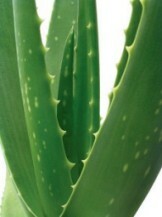 In herbal medicine, Aloe Vera is known for its miraculous nourishing, softening and moistening effects. For centuries, the extracts of Aloe Vera were used by Native Americans and people of the Caribbean region for improving the quality of their hair. Nowadays, extract of this plant is one of the most effective ingredients of many commercial products: cosmetic, skin care creams, various creams for wound, cut and burn care, hair care products, etc. Aloe Vera is advantageous for its properties to stimulate growth of new hair, as well as its anti-inflammatory, nourishing and soothing effects. Extracts of this plant can help to prevent hair loss by nourishing and stimulating new hair follicles, that results in improving overall heath of hair. Besides, using products with Aloe is very positive not only for hair follicles, but also for the scalp: extracts of this plant help to maintain proper balance and normalize biological processes in the scalp, relieve itchy, dry or oily skin, cleanse the pores and balance pH level. In addition, Aloe Vera can reduce seborrhoea, a special condition when sebaceous secretion mixed with dirt causes formation of dandruff or yellow greasy crusts, followed by possible infection of the scalp and damage of hair follicles. Seborrhoea is one of the main reasons for partial hair loss and baldness, which is usually caused by improper hair care, negative environmental factors, various genetic abnormalities, hormonal imbalances, stresses, excessive anxiety and psychological disorders, etc. A great deal of shampoos, conditioners, gels and other hair care products contain Aloe Vera. Also, there are special hair oils with Aloe Vera extrat that can be rubbed into the scalp. Besides, a variety of hair care products contain Aloe Vera combined with such natural ingredients as coconut oil, jojoba oil, shea butter, vitamins and herbal extracts, which strengthen therapeutic effects of the product, stimulate hair regrowth, help to make hair stronger, softer and healthier. « Can Acupuncture Help to Regrow Hair?